Bentley's SUV will be based on the EXP 9 F concept, shown, but will look more Bentley-like. Bentley, the venerable British carmaker famous for luxury sedans and coupes, said it will proceed with development of its first SUV. The vehicle will be "the most powerful SUV in the market" when it goes on sale in 2016, the company said in a statement. Bentley is owned by the Volkswagen Group. Bentley will produce the SUV in Crewe, England. No technical details were released, but the SUV is expected to be priced at about 180,000 euros, or about $237,500 at current exchange rates, according to previous comments by company executives. "This new fourth model line will leverage the success of the global SUV market," Bentley CEO Wolfgang Schreiber said. It will be a key model in Bentley's goal of almost doubling sales to 15,000 vehicles by 2018. Last year, Bentley delivered 8,510 cars, up 22 percent from 2011. The vehicle will be based on the EXP 9 F concept unveiled last year at the Geneva auto show, but the design has changed substantially. 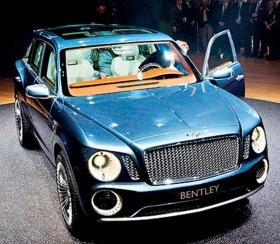 A Bentley spokesman said the production SUV would look markedly different from the concept. "We've made substantial changes. It will look like a true Bentley," he said. The EXP 9 F's bold design upset senior VW executives. The car sported flourishes such as picnic baskets for polo-ground tailgating, 23-inch wheels and gaping turbinelike air intakes.